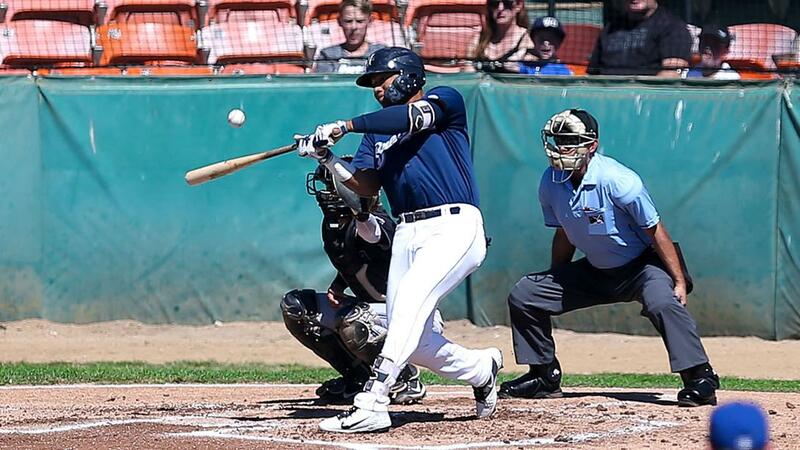 Brewers LG Castillo hits a fly out to center field during Sundayâs game against Misosula in Helena. The Brewers won 6-5 in extra innings. Missoula, MT - The Brewers were locked in another tight game against the Osprey on Wednesday night, but Missoula in the sixth inning broke a one all tie and never looked back. They scored six in the inning and sent ten to the plate, taking a commanding 7-1 lead. Missoula won 7-2, sending Helena to their third straight loss. For the second straight night, Helena got the first run, and it was thanks to some creative base running that got the Brewers that run. Jesus Lujano singled with one out, and got to second two batters later on an infield single from Yeison Coca. LG Castillo then singled to right, and Lujano was waved around third and appeared to be out at the plate. However, he danced around the tag of the catcher Nick Dalesandro and touched the plate, making it 1-0 Brewers. Missoula though as they did last night, tied the game in the fourth. The first two reached on infield singles, but Brandon Leyton hit into a double play, moving the lead runner to third. With Cesar Garcia up, Helena starter Michele Vassalotti threw a wild pitch, plating the runner and tying the game. Vassalotti only allowed one run in five innings, and was under 60 pitches so he was allowed to pitch into the sixth. Yet in that frame is where it all fell apart, as Kristian Robinson started off the inning with a home run to deep left center field, making it 2-1 Missoula. That was only the beginning, as Eddie Hernandez followed with a triple, scoring immediately on a single from Leyton. Garcia hit into a fielder's choice, and with Dalesandro up stole second. Dalesandro singled him home, ending the night for Vassalotti. Three more scored in the inning, capped off by a two RBI triple from Alek Thomas. Jacob Stevens earned the win for Missoula, posting two scoreless innings out of the bullpen. In defeat, LG Castillo and Jesus Lujano each recorded three hits, while Luis Avila had a two hit performance. Tomorrow the Brewers look to finish the season on a high note as they play the Osprey for the final time in 2018. It also marks the final game in the history of the Helena franchise. First pitch is scheduled for 7:05 PM, with the pregame show hitting the airwaves of helenabrewers.net at 7 PM.